Any additional toppings you like, mini pepperonis, diced up bell peppers, pineapple, you name it, just dice it small! Preheat oven to 350 degrees, cover a large baking sheet with foil or parchment paper. 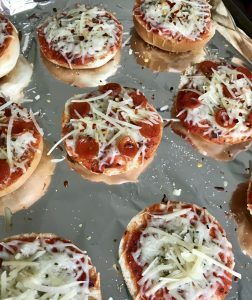 Lay out bagel halves, for each half spread 1 tablespoon pizza sauce and top with 1 heaping tablespoon mozzarella cheese. 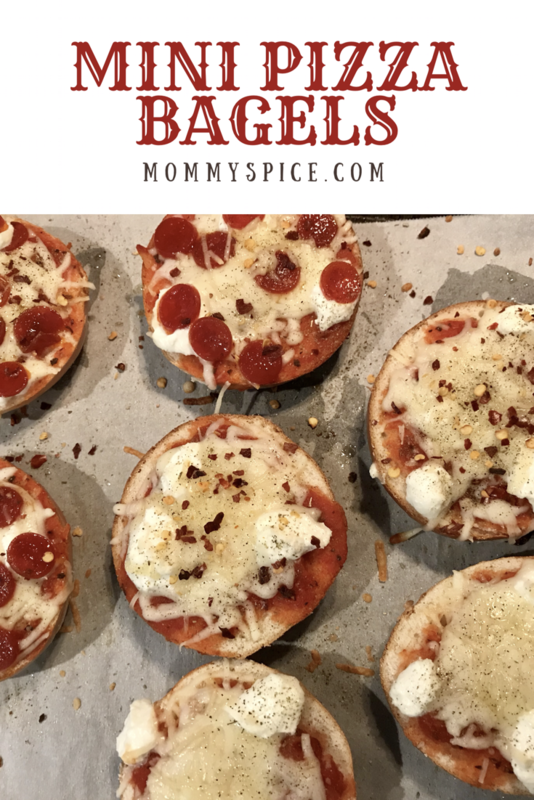 Once all bagels are topped sprinkle with Italian seasoning and bake 10 minutes. Once done either eat up, or flash freeze. If you plan to freeze the whole batch just stick the entire baking sheet into your freezer. Once frozen, place into a freezer safe zip top bag and date, I like to use mine within 3 months time, but truth be told they’ve never lasted that long. 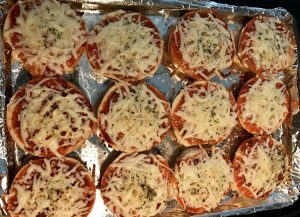 If you want to reheat them from the freezer, I like to do a 350 degree oven for 10 minutes. Or 2-5 minutes in the microwave, however you’ll lose a good bit of texture, but you can’t beat the convenience. If you’d like to pack these in your kids lunch I usually pull them out the night before and place them in the fridge, however the morning of might also work depending on how early your little one has lunch time. My tip for these is if you are planning to freeze them not on your baking sheet make sure they are on a plate big enough to where they don’t touch. It’s important they freeze independently to keep their structure and for easier packing. 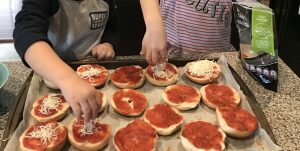 You and your kids will love these, and making them together is that much more special, the more I involve my kids in what I make the more willing they are to try new things. Also food is family and pizza is our love language ? These are great and I actually made them with my pre-schoolers and they were a huge HIT!